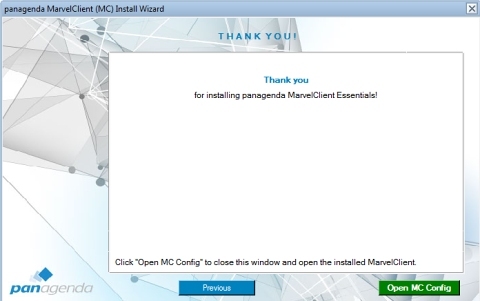 Want to learn how to easily use the MarvelClient Upgrade Free Edition? 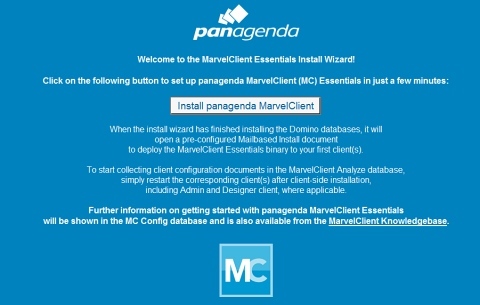 You are using either the free MarvelClient Essentials or a licensed variant of MarvelClient. 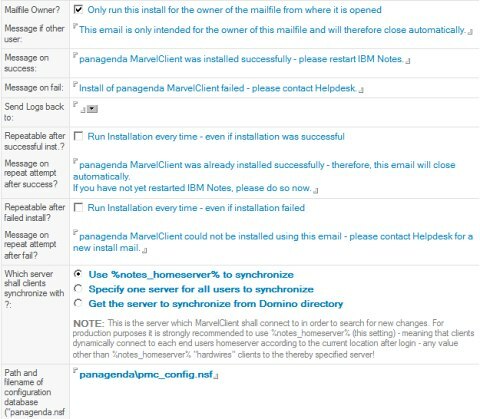 The MarvelClient Configuration and Analyze databases already exist on at least one IBM Domino Server in your environment. 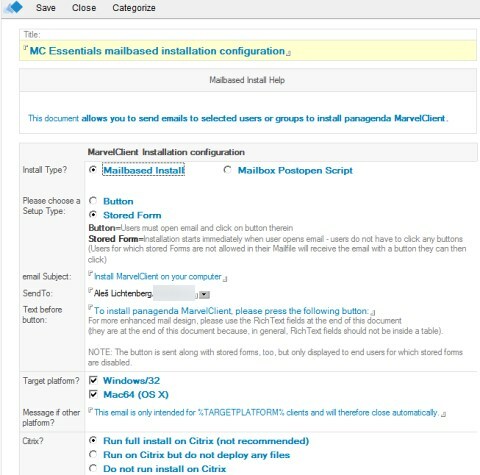 Make sure you have the latest MarvelClient components available by running an Online Update in the MarvelClient configuration database. 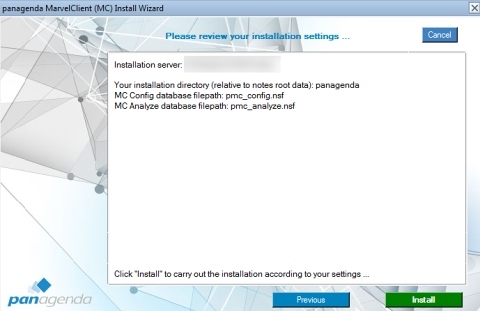 The local mc.dll / pmc.dll version on the user’s computers must be minimal 10.x. 4. 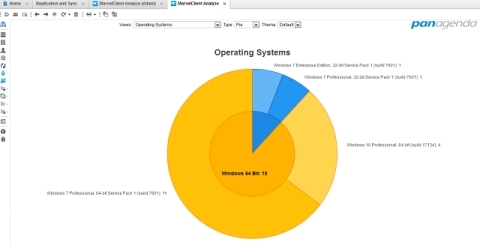 On the Distribution tab you can choose whether the package distribution to your clients will be handled by MarvelClient itself or your very own solution. 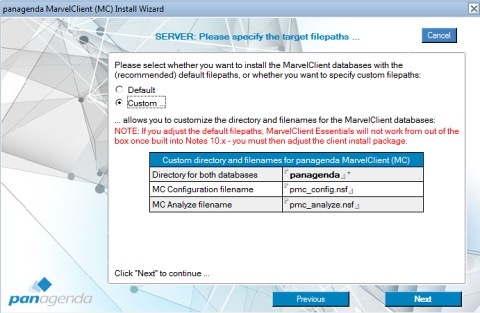 If MarvelClient is to deploy the package, you must specify from which source the clients will download the upgrade package. You can choose between a file path (UNC or a mapped drive) and a URL (https or http). 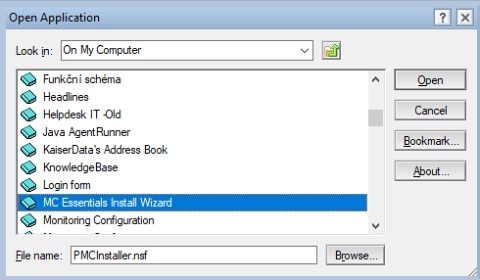 On the Distribution tab you can also index your installation packages to select them for your Upgrade. 5. 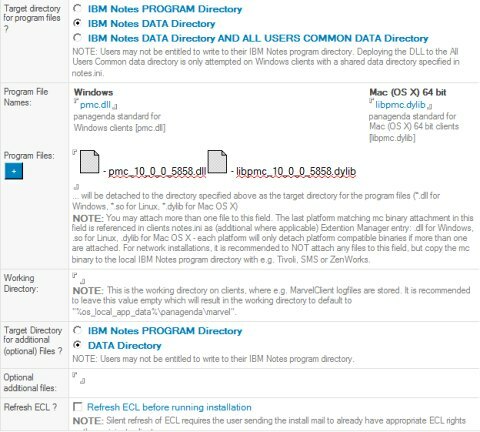 To index the “Full Client Installer”, click on “Index Installers)”, select the IBM Notes 10.0.1 installation package and click on “Open”. 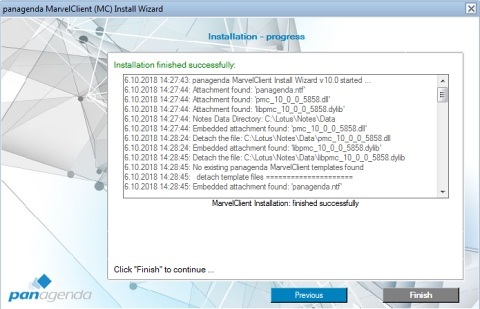 MarvelClient will then automatically create the working folder for the build process (“%public%\MCUpgrade\build), detach MCUpgrade.exe and license_upgrade.xml into that folder. 6. 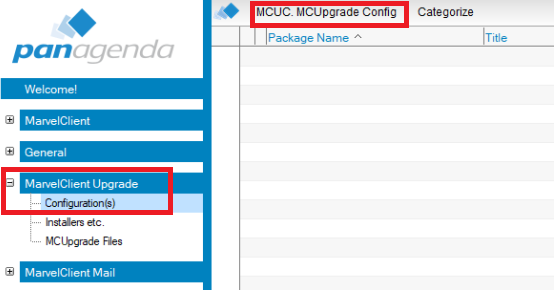 On the Conditions tab you can easily choose the required conditions for upgrade configuration. 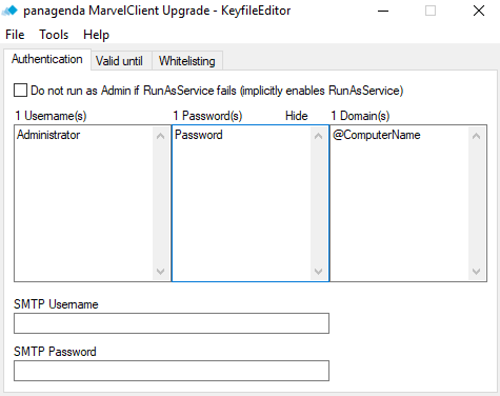 We will use “Run via MarvelClient → MCUpgrade as Admin” = “using a local built-in administrator account”, because most users do not have Windows administrator rights.. To ensure that the Upgrade is exclusively done with your provided Admin user credentials. 8. 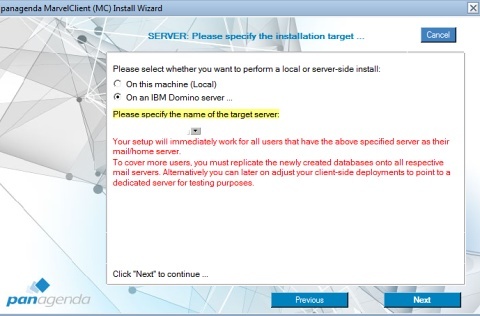 Enter the account name (Administrator) and corresponding password on the following screen. 9. Save the “MCUpgrade.mcu” file. 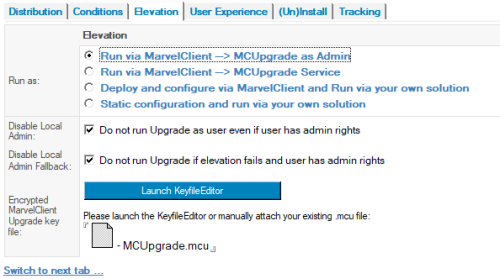 After saving your MCUpgrade.mcu file and closing MCKeyfileEditor, your .mcu file will be attached to your upgrade configuration automatically. 10. 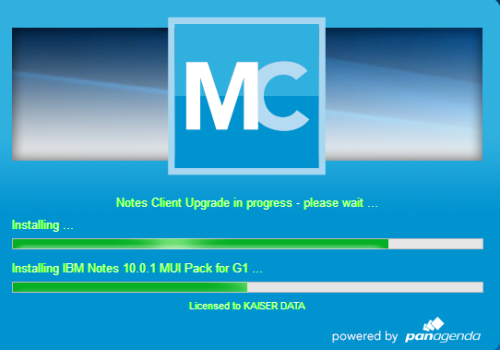 During the Upgrade process, MarvelClient Upgrade will show a Splash Screen with progress bars. 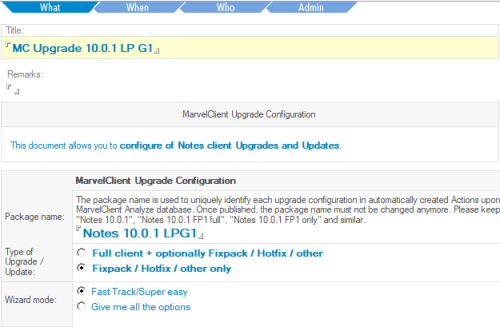 MarvelClient Upgrade Free customers can choose between 10 different designs, which can be configured on the User Experience Tab. 11. 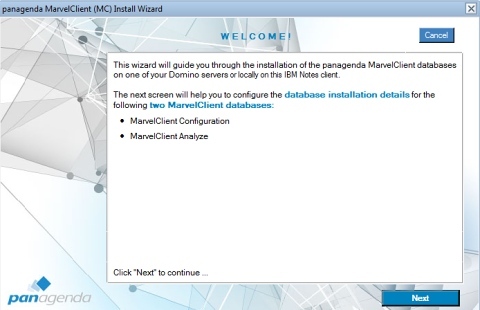 One of the most important tabs of the MarvelClient Upgrade Wizard is the (Un)Install tab, which controls whether the current client will be uninstalled before the new installation gets executed and the exact command lines for the full client and/or additional install packages and their order of execution. 12. Tracking tab. 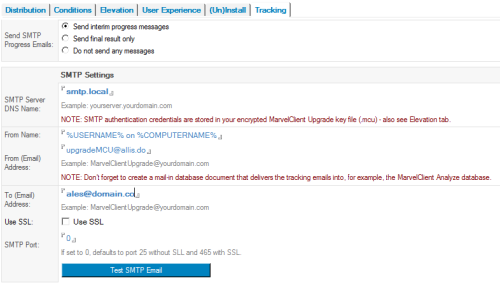 MarvelClient Upgrade is able to send so called “interim progress messages” during an upgrade, as well as final “success” or “fail” reports at the end of an upgrade via SMTP. 13. The last thing we need to do now is to publish “Upgrade Configuration”. 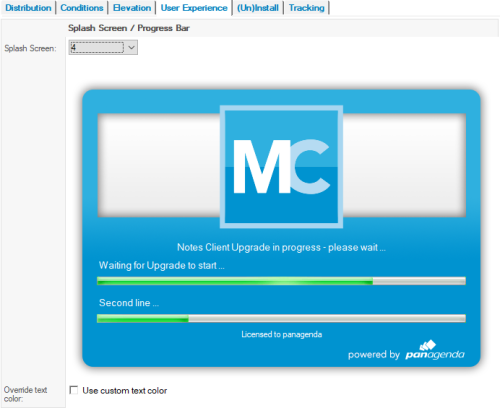 The “Prepare or Publish Upgrade” button will first prepare all necessary components in %PUBLIC%\MCUpgrade\stage. 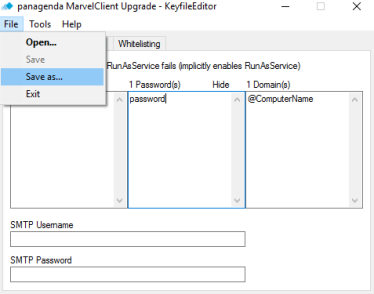 Upon completion of preparation, it will ask you whether you want to publish the upgrade into MarvelClient Action that will take care of the rest. We choose YES for publishing, which then creates all needed MarvelClient Actions automatically, so that all corresponding Notes client are automatically upgraded to Notes 10.0.1. 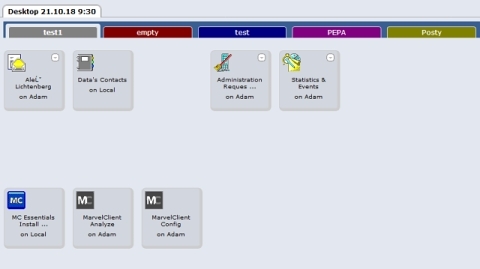 If you do not configure any of the above tabs, then ALL USERS will get the client upgrade. 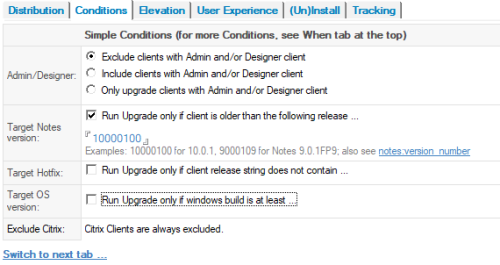 If the user logs in to the Notes client, a window with the client upgrade information appears. The client then closes and the upgrade starts. 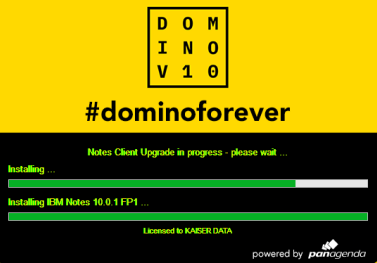 The installation and configuration was very intuitive and in a very short time I reached the upgrade of the first Notes client. Yes, it was in a test environment. I also tested FP1 installation and I think it was even easier.